I deliver beautiful images and I create happy clients. I'll answer my phone. I'll listen to your needs. I'll keep it simple and I'll make it fun. Get more for your wedding! 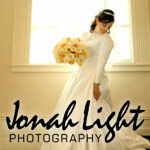 Don't forget to mention ChossonKallah.com when visiting Jonah Light Photography - Lightbeam Studio.